The LSP MagnaMist is used for all types of cutting tool lubricating operations such as grinding, sawing , milling, drilling, tapping and others. Whatever your metal removal requirements are, chances are there is a LSP Mist Coolant System that can dramatically improve the quality and productivity of your operation. Dispense an air driven spray mist exactly at the point of contact between the cutting tool and the work piece. Velocity of the mist prevents the tool from slinging it away before it can do its job. Efficiently dissipates heat created during heavy, high speed cutting Mist cools as it expands upon release from the nozzle. When it comes in contact with the heat from the cut, water in the mist evaporated, taking heat away. Systems can easily be installed without interfering with the work or operator areas. A variety of units in different sizes and confugrations make this possible..
Fine,transparent mist has the velocity to resist slinging even at high speeds. That means splash guards and shields aren;t required, allowing your operator to view the operation without interference. 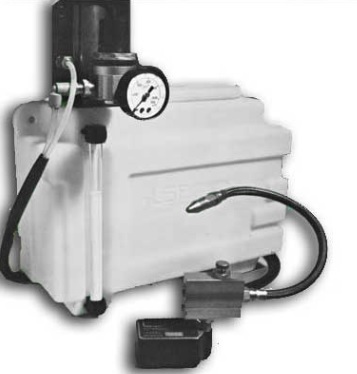 External controls allow easy, yet precise, adjustment by hand..
Adjustability allows the operator to set the unit so that ecess fluid is kept to a minimum.